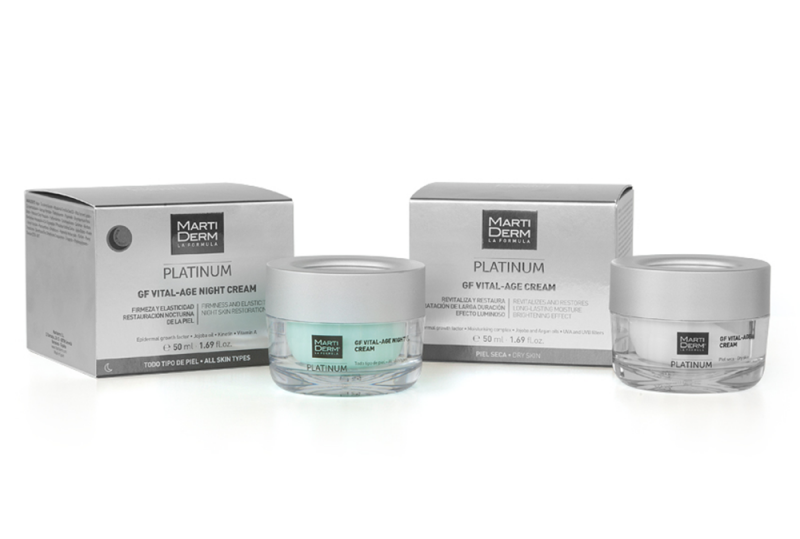 Ageing is expressed through multiple visible signs: Expression lines, under-eye puffiness and dark circles, lack of moisturising, loss of firmness and density… Knowing both the internal and external factors that cause them, MartiDerm has developed a product range to combat their onset and reduce them if they have already appeared. Products with innovative formulas and the latest technologies that blend precise and cutting-edge active ingredients with high-end textures and scents that respond to the needs of the most demanding skin to practice Smart Aging. A latest-generation proteoglycan, exclusive to MartiDerm, with a powerful anti-wrinkle and firming action which also provides effective biological protection against the harmful effects of UV rays. With a high antioxidant power and collagen synthesis precursor capacity, it ensures deep and effective action without irritating skin or making it photosensitive. Its tissue regeneration power is the same as that contained in blood, so it relaunches all cell repair systems along with collagen and elastin synthesis. Its significant water retention capacity makes it the most powerful active ingredient for rebalancing water levels. Messenger peptides that activate the cells’ natural biological processes, restoring the energy and information they lose over time. Each product in the Platinum range has precise active ingredients adapted to the cosmetic purpose it aims to achieve. 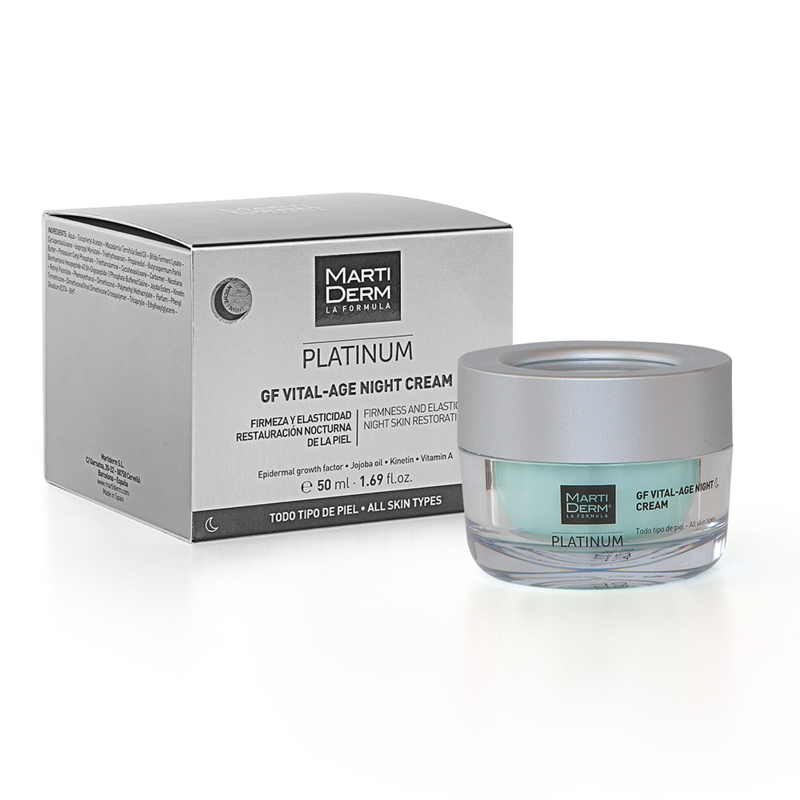 Vital-Age Cream and Vital-Age Night Cream belong to MartiDerm’s Anti-Aging Platinum Series, which consists of intensive, highly-effective anti-aging skincare products from ampoules to serums. 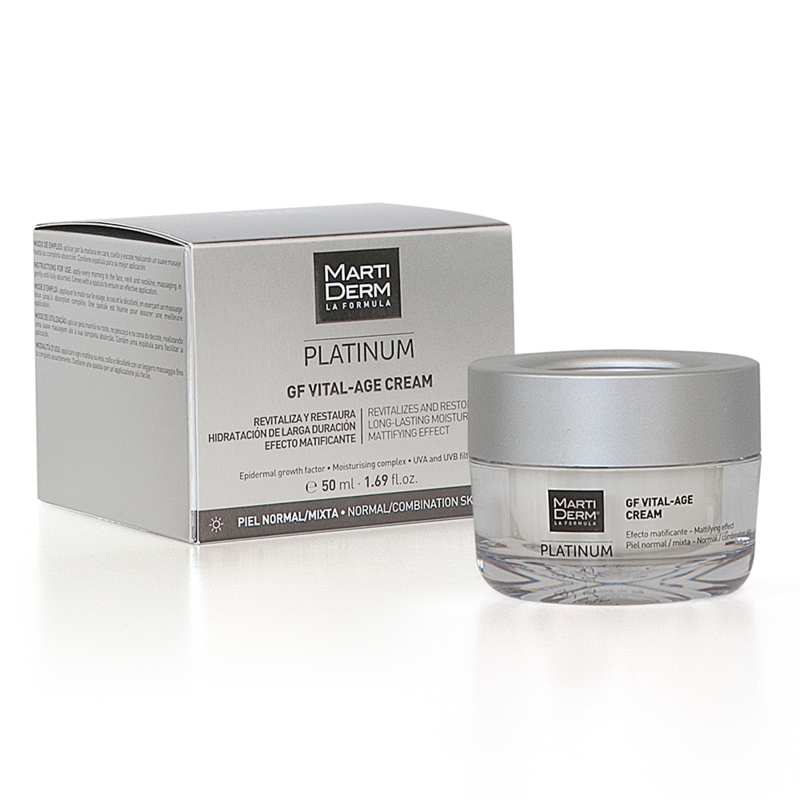 The Vital-Age creams is a moisturising and revitalising cream with a powerful moisturising and nourishing skin action, giving you all-day-long comfort. The dry skin version has a brightening and health-giving effect while the version for normal and combination skin leaves the face looking mattified. It even comes with sun protection of SPF 15. Instructions for use: Apply in the morning to the face, neck and neckline after Krono-Age Serum and/or MartiDerm ampoules. This is a cream with a powerful anti-wrinkle action that renews the texture and appearance of the skin, restoring suppleness and shine, toning and reducing water loss through the skin. The exquisite texture is at once rich and lightweight, with a suspension of small jojoba beads containing the nourishing and restorative power of the pure botanical oils that are dispersed in the epidermis from the moment of application for superior effectiveness. Instructions for use: Apply at night, massaging in gently as the first step following your daily cleansing and continue with your regular treatment. One of the most important steps of a smart-aging routine is moisturisation. The Vital-Age series gives your skin all that it needs to maintain a wrinkle-free, youthful appearance. When used in conjunction with the rest of the Platinum series, the results are visible from the get go! Remember that consistency and good health are also key to slowing down the aging process, so be sure to take care of yourself from the inside as well.